Why are all the russian sentences not written in cyrillic alphabet but in latin alphabet?? Hello, I am not a beginner in russian, and I find it very disturbing that the russian sentences from the new russian course are not written in cyrillic alphabet! I find it very difficult to know how to translate the cyrillic letter in the latin alphabet, and it adds another difficulty. For example I did not know that х in russian should be written kh, or if я would be ya or ia, or ж should be written zh in latin alphabet! And I don't know how to write in the latin alphabet the letters й or и, or the difference between э or е., or ь оr ц or ж! And I don't want to learn that, it's useless. Looks like that question is the most popular on the forum. I'm beginning to think they need to start pointing that out at the start of every lesson in the Alphabet section. It was really obvious for me, but doesn't seem that way for most. Or making the default Cyrillic. I had a moment of 'my eyes! my eyes!' before I saw the button. Or maybe making a sticky post named "How do I change the Russian course to Cyrillic", or something of that sort. That would be a good step. I get the impression a lot of people never make it this far, but evidently those who post questions about it do, so it would help them! I think Shady_arc mentions it in his alphabet/keyboard post, but I think a lot of people don't think to look there for this issue, which is sort of understandable. I have a feeling that there are a lot of people that have never been to the website because of relying solely on the app. I didn't even know that the app was an extension of the website for the longest time. And I wonder how many users that do come to the website will never even bother going to the discussions. I think in the end, something in the introductory lessons to assist with the unique features would be best. Hopefully it's a little more obvious when it does come to the app, but judging how often I've seen people be oblivious to the largest of buttons in other apps (or even tell me "I had no idea that the back button would actually take me back! "), there will never be a perfect solution, no matter how much we highlight it! @TimothyCrabtree Currently the Android app doesn't seem to have a transliteration mode at all. It defaults to showing the Cyrillic script even if the website is set to show the transliteration. Personally I think they should just make the Cyrillic script mode the default mode. If someone prefers to use the transliterations they would still have the option but I see no reason to have it as the default. @A_User I'd argue that that's not really a good reason to do it. Everyone has to start somewhere, and that's what the early alphabet lessons are for - easing the new student into the Cyrillic script. By defaulting to transliteration they are effectively cheating the new student out of their best opportunity to start getting used to the new script. Personally, I actually think they should get rid of transliteration as a separate mode altogether, and just include it as a pronunciation guide in the mouse-over tips. Yeah, that isn't really where I would look either. It would help if people would use the search feature, though. @A_User Actually i don't see why it couldn't be changed at any time. The thing is though that it would most likely have to be done by the duolingo team, rather than the Russian course contributors. After all, it would not involve any change in the material, just in how that material is presented in the interface. They probably have the transliteration as default for those who start knowing no Cyrillic. @SiblingCreature I don't currently see Russian available on the android app. I didn't think it was available yet on any of the apps. I tried using Russian on my android tablet once and it seemed to behave the same as the website for me. Though I haven't seen it on an Android phone yet since I don't have access to one, so there could be a difference there. @SiblingCreature I personally would agree with you. But I don't know if that would even be possible until they make a new tree. @SiblingCreature I don't know enough about how they do that sort of thing to argue with you, so I won't even attempt it. But if it is the Duolingo team who does it, they're apparently rather swamped, and I suspect this wouldn't be that high of a priority. But if you want them to see this, maybe we should make a new post with the suggestion? For me it was very obvious as well, but as you said, it doesn't seem like that for everybody. indeed I should say boo the designer... one can really oversee it! 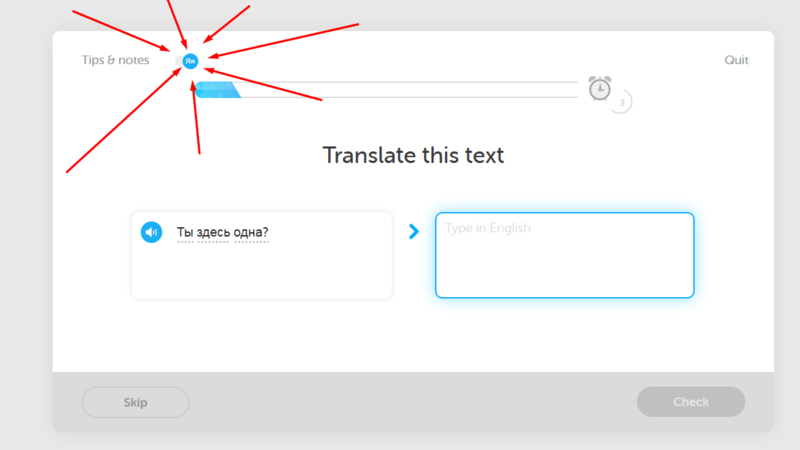 When you are doing a lesson, there is the option to change alphabet in the upper left corner. Click on it and it will change to Cyrillic. oh I did not know! it´s perfect then! Thanks a lot! For the record, I want to register an objection with those people who downvoted this discussion. I don't know your reasons, but it is a legitimate activity to ask a question, and this is neither a stupid question nor off-point. Downvoting should be reserved for inappropriate or troll-like activity. Otherwise, live and let live! I agree! согласное, I think the word was. Or согласна. Согласна. Write it a hundred times and you'll remember :-) The masculine form is согласен. Why are the Russian lessons not written with cyrillic / russian characters ?